The WebSocket protocol is an IETF proposed standard as described in RFC6455. 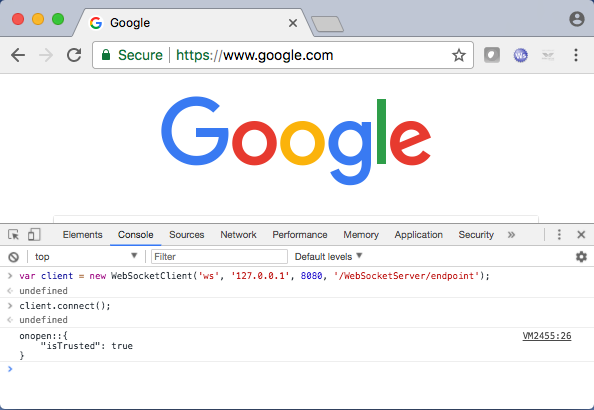 The WebSocket protocol defines 2 new URI schemes: ws and wss for TLS encryption. The Java WebSocket API runs on Servlet containers such as Tomcat, JBoss and Websphere. See Oracle’s JSR 356 for specification details of the Java API for WebSocket. HTML5 compliant web browsers provide an implementation of the specification to enable clients to connect to a WebSocket server and to send and receive data (IE10+, Chrome 16+, Firefox 11+, Safari 6+). Below is the Java source code for the WebSocket server endpoint implementation. In line 10, the annotation @ServerEndpoint is used to decorate a class that implements a WebSocket server endpoint. 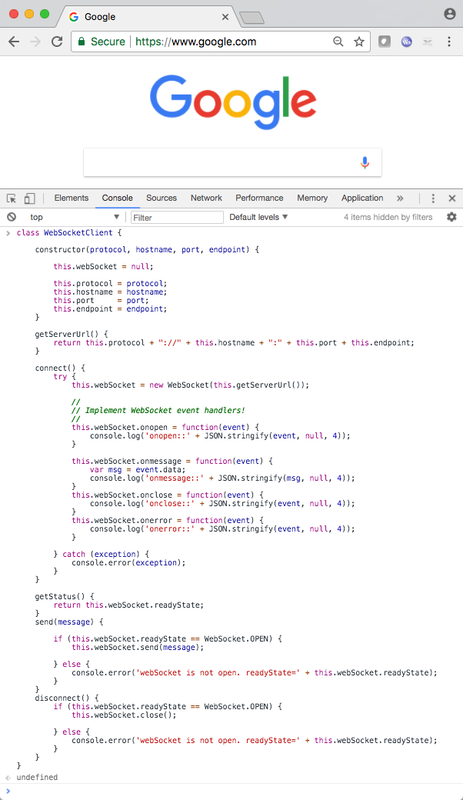 Four more method annotations are used to decorate event handlers for WebSocket client connections. These four methods are invoked by the container. The Eclipse Neon IDE for Java web development and Apache Tomcat 9 were used as described in the post below to implement the class and to deploy it. 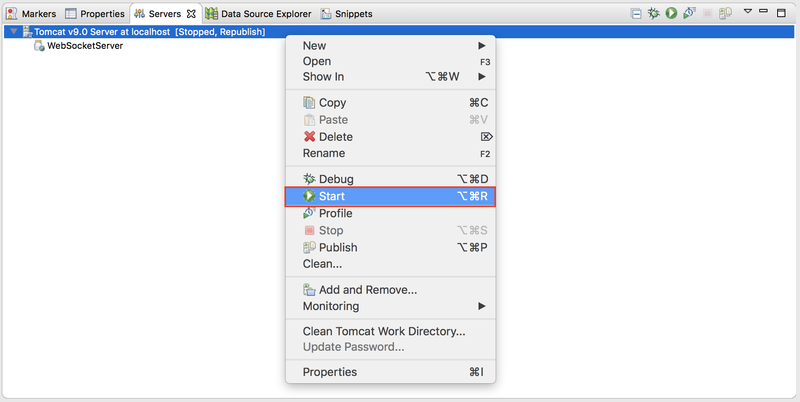 This setup allows to run the WebSocket server application on Tomcat from within Eclipse. The above image shows the basic structure of the dynamic web project in the Project Explorer. Note the tomcat-websocket.jar file in the Apache Tomcat v9.0 server runtime library. It contains the Java API for WebSocket support. Here, the web application is run from within Eclipse using the dynamic web project setup mentioned earlier. No configuration changes to Tomcat are required to run a WebSocket server endpoint. The port number will be the same as the one used for connections via the http protocol, e.g. 8080. Use the Console tab in Eclipse to view the Tomcat server output and to catch potential errors on startup. // Implement WebSocket event handlers! 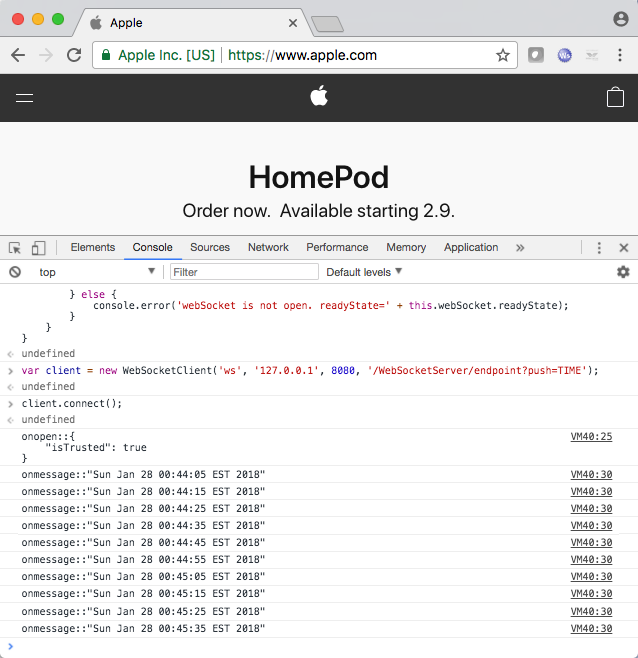 Then call the connect method to open a new connection to the WebSocket server endpoint. The browser will call the event handler onopen once the connection has been established. At this point, the container that is hosting the WebSocket server endpoint will call the server implementation’s onOpen method. In this example, the server simply prints the session Id, which is 0 here. 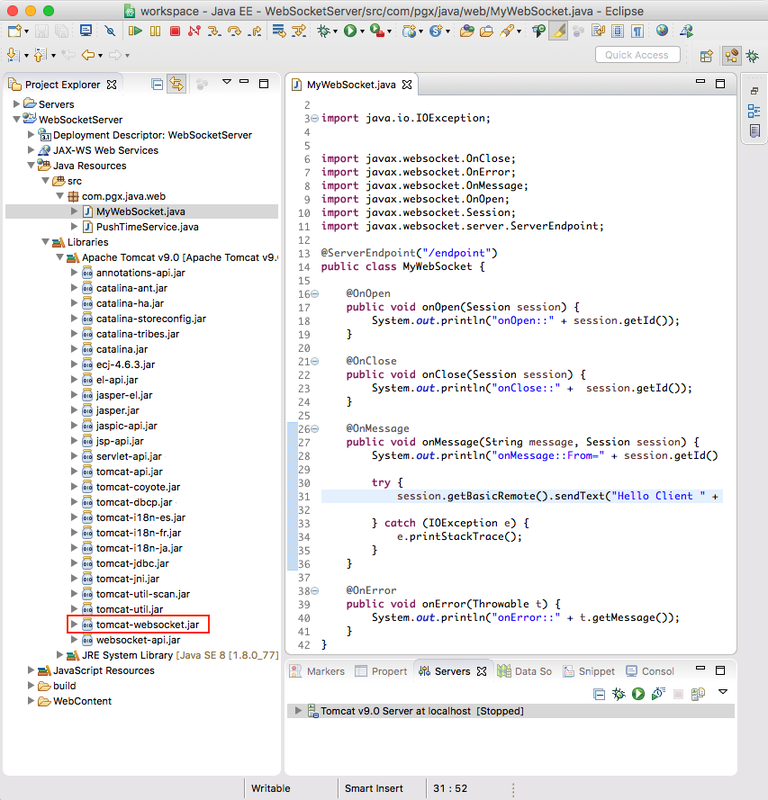 See the onOpen method of the MyWebSocket.java class from section 1. See the Oracle documentation for details on javax.websocket.Session. The server returns a greeting message to the client, here "Hello Client 0!" See line 34 of the MyWebSocket.java class from section 1. At the same time, the container that is hosting the WebSocket server endpoint will call the server implementation’s onMessage method. The server simply prints the client’s message to the console. New code has been added to the onOpen method between line 21 and line 32 as shown below. The PushTimeService class maintains a collection of active Session objects and periodically sends the current server time to all clients that have subscribed. // Access request parameters from URL query String. // If a client subscribes, add Session to PushTimeService. The Java source code of the PushTimeService.java class is given below. This class implements a singleton and runs in a separate thread. Every 10 seconds, it iterates over its collection of subscribed clients and sends the server time to each one as a WebSocket message. If the session has been closed, it is removed from the collection. The PushTimeService class sends the server’s system time to both clients, every 10 seconds. Similar approaches can be used to push a variety of event driven data from the server to clients in real time. 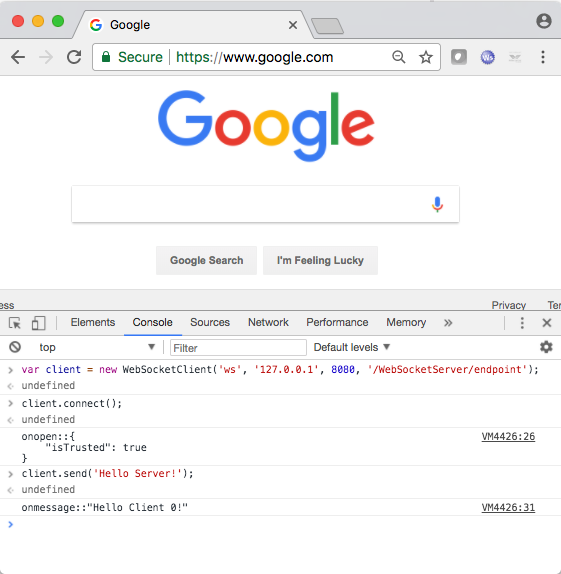 Since the client’s WebSocket connection resides in the UI layer, WebSockets are a good solution (alternative to polling) for driving real-time UI components such as stock tickers or notifications. 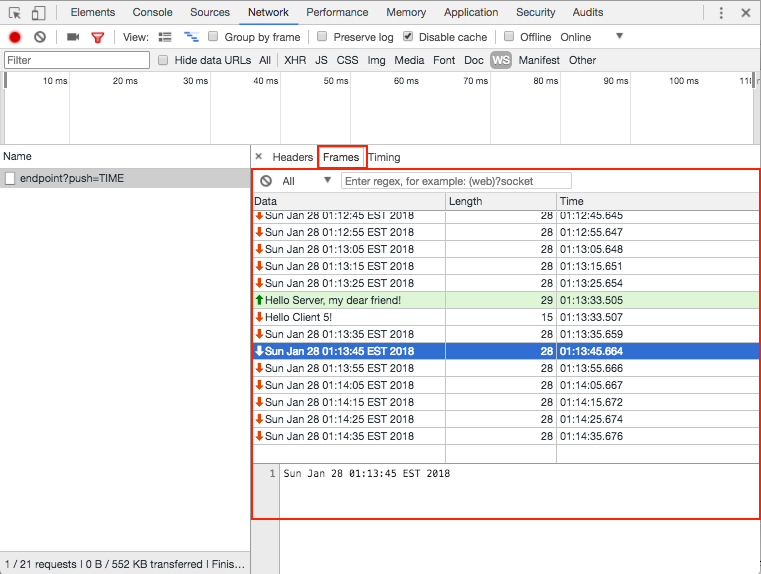 The Chrome Developer Tools provide means for basic monitoring of WebSocket traffic. Use the Network tab and then filter the traffic with the WS button to only show WebSockets. 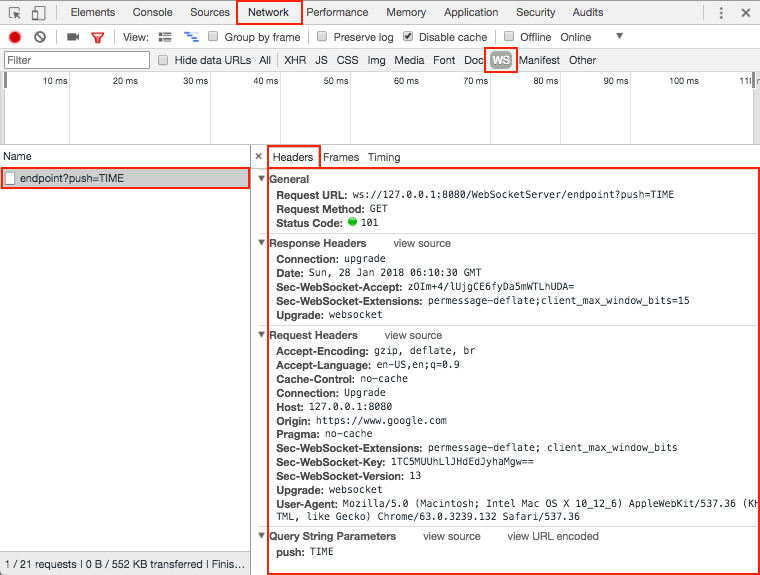 The Headers tab shows the client http request and the server response. The Query String Parameters are listed at the bottom. Note that the server responds with a connection upgrade in the response header to upgrade the http connection to a persistent WebSocket connection. See the protocol upgrade mechanism for details on this process. The Frames tab shows all outgoing and incoming WebSocket messages. Click on a frame to see its content. 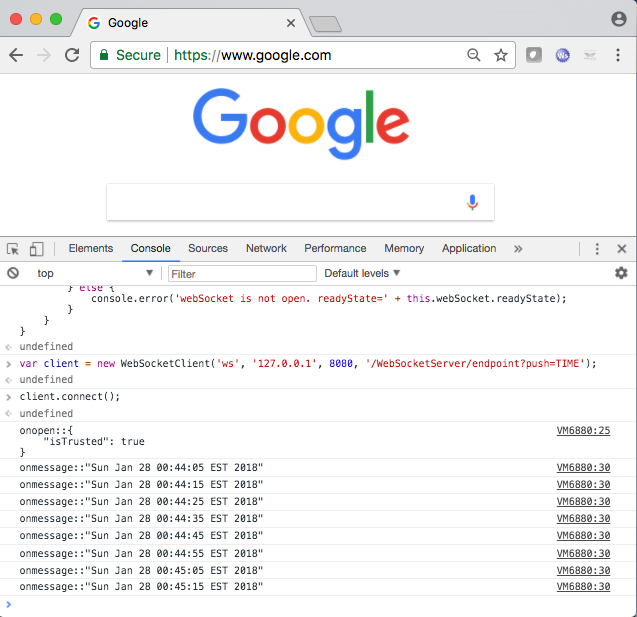 The Timig tab shows how long the WebSocket connection has been open. In the below example, it has been open for 4.4 mins.